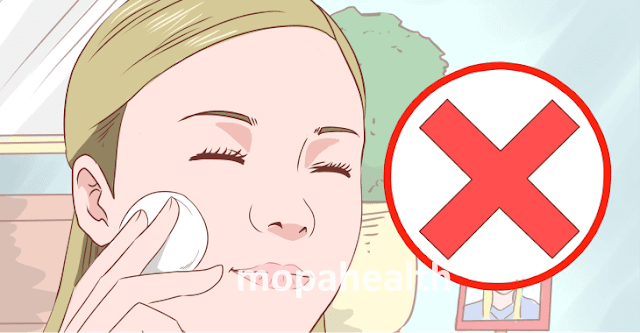 How to Get Rid of Oily Skin, or 4 Easy Tips for Your Permanently Fresh Look - It goes without saying that oily skin has an unpleasant look either for its owner or surrounding people. Moreover, such a face condition may cause blackheads, zits, acne, blemishes, and so more. Unfortunately, both women and men experience all those things today. But, luckily, there is no problem at all if to learn how to get rid of oily skin fast and naturally. First of all, one should know the main reasons of oily skin. They are hereditary problems, as well as excess sebum secretion by oil glands. Certainly, no one can eliminate the 1st cause, but a person may handle with the 2nd one himself, due to simple skin care tips and treatments. In fact, there are different skin types, as well as no predetermined skin conditions. Our skin can change because of different inner and outer factors. But oily skin treatment is rather simple, though many consider it difficult. Why is it so hard to use professional recommendations for managing natural body’s production of skin oil? Of course, nobody wants to have a shiny and greasy face, which leads to concerns. But except being associated with negative things, oily skin has its own benefits, no joke. The point is that oil produced is our body is a way of hydrating and keeping skin healthy. This means there will be no acne and wrinkles later in life. But when a person has too much oil, this is a problem, really. Simply minimize the amount of all that unnecessary skin sebum. Then it will help to protect your skin from aggressive environmental factors, such as high/low humidity, extreme temperature, sand and dust. All you have to do is removing excess sebum twice a day: either in the morning or before going to bed. More so, you can wash the skin when it becomes and feels too oily. However, don’t do it too often to avoid extra sebum production. Wash your face with hot water, but not cold, to remove oil better. No soap or any creamy cleansers, as they can overdry/make your skin flaky, or leave too much oil, as a result. Before going to bed, wash your face with hot water, then with cold water. Repeat the procedure for 5-7 times for boosting blood circulation and clearing pores deeply. After that, perform a face massage on forehead, chin, cheeks, nose and temples. Then, wash the face once more to clean the opened pores. To control oil production by your skin’s pores, you should control nutrition. These are fats from food and hormones that produce skin oil. So, try to add more vegetables, but remove fatty foods from the ration. It will be good to visit an endocrinologist plus dermatologist, in order to consult about proper nutrition. Also, try not to worry; thus, you’ll reduce the levels of stress and anxiety. Besides, think of the water level in your body. Why not drink 2 liters of fresh water every day? This way your metabolism will be on a perfect level. Use water-based care products for your oily skin. Generally, they do not contain oil, being suitable especially for you. Better avoid alcohol-base toners, as they almost always overdry your skin, although clean it very well. Just find a proper oily skin cleanser and oily skin moisturizer. The perfect alternative is skincare products on the basis of glycolic acid, as it is considered both a natural skin exfoliator and moisturizer. In other words, how to get rid of oily skin means cutting down on your skin oiliness naturally, according to the dermatologist’s advice.